Home › Anime › Megazone 23 Special – Part 1: So You Just Combined Streets of Fire With Science Fiction? 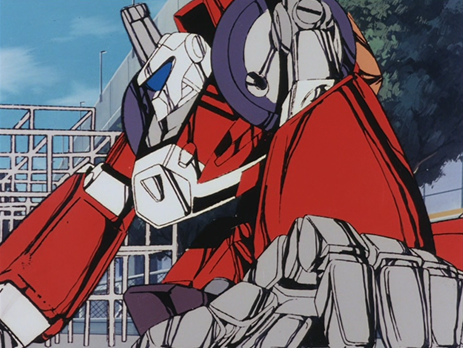 Megazone Part 1 was directed and part created by Noboru Ishiguro. He seems to have shared the director’s chair with recognizable names like Leiji Matsumoto on Space Battleship Yamato and Shoji Kawamori on the Macross movie The Super Dimension Fortress Macross: Do You Remember Love?. He was also the director for the long running OVA/TV anime hybrid Legend of The Galactic Heroes, making it safe to say that Noboru Ishiguro has had his hand in some of the greatest works of Sci-Fi anime of the last forty-years. Most recognizable for readers that might remember watching Robotech on TV, is the Super Dimension Fortress Macross lead character designer Haruhiko Mikimoto who takes full charge of Megazone Part 1 (his designs for the character Eve do show up in following parts). Megazone 23 Part 1, starts by what I consider to be one of the most rapid-fire opening five minutes of an Anime that I have ever seen. Clocking in around almost seven minutes, the oddly credit-less opening involves our rebel-without-a-cause lead Shogo Yahagi speeding away on his Suzuki brand motorcycle from the cops, almost crashing into our other lead Yui Takanaka. Since she is late for work he offers to drive her and then he goes out on a bubbling outing with friends. By this point, the amount of leather jackets, sunglasses, shopping, worshipping the city’s most popular idol Eve, and shots of woman dancing in leotards and thick socks has easily convinced me that Megazone 23 might just be the most eighties anime in existence. This truly is life in Japan during the eighties. But enough of this setting of the mood, what is Megazone 23 all about plot wise? Shogo Yahagi’s days of motorcycle riding and good times are interrupted when a friend of his shows him a futuristic looking motorcycle known as the Garland inside of a parking garage. But seconds after this reveal, MIB looking men shoot-up the place and Shogo is forced to escape with the Garland, leaving his friend behind. Days later after decaling the Garland red and getting a call through to Eve’s popular TV show to showcase his newfound discovery, Shogo is once again surrounded by the shadowy men. Some of these men are driving similar motorcycles to that of the Garland. These motorcycles have the ability to transform into robot suit mechs. All is good particularly when Shogo learns that the Garland can also transform, thus allowing him to successfully flee. Time passes and his relationship with Yui increases, which leads him to consequently spend more time with her two roommates (Tomomi and Mai). While driving the Garland with Tomomi, they stumble upon a secret passage that reveals to them that they live not in the Japan of the eighties, but a fictional environment housed on a spaceship. This spaceship, which is controlled by a super computer by the name of Bahamut that, looms as a tower in the far distance uses a virtual idol Eve to keep its inhabitants safe from the outside. But some military forces that oppose Bahamut are building their forces, and it seems that Shogo is caught in the middle of all this secrecy. 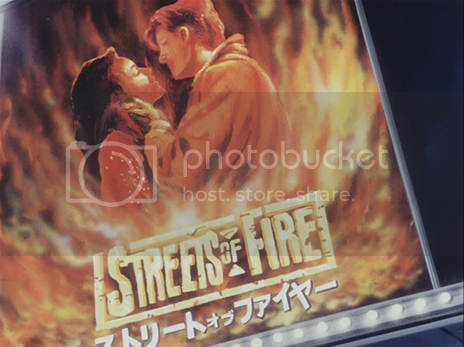 In the past on this lovely site I reviewed the American film Streets of Fire, to which I drew connections to what Megazone 23 would become. Yes, Shogo and company see Streets of Fire in theaters, thus cap stealing? the tone for the rest of the OVA. The upbeat but at the same times lonely eighties’ ballets performed by singer Yoshiko Miura would fit just as easily by Ellen Aim during parts of Streets of Fire. Composer Shiro Sagisu, who is known for all the music from Evangelion and Bleach (not to mention the fantastic The Skull Man soundtrack) was also involved in the Megazone 23 Part 1 soundtrack. His pump-you-up rock tracks with their heavy guitar chords make Megazone 23 all the more exciting. What is quite easy to see from what I have reviewed in the past, I have a soft-spot for eighties anime character designs. I love Kenichi Sonada’s work in Riding Bean and Gall Force, I think that Kei from The Dirty Pair looks awesome, and I do enjoy Akio Sugino’s character designs in They Were 11. Haruhiko Mikimoto’s designs fit that need for big colorful hair, and while I believe that it is only demonstrated to a degree within Megazone 23, I still believe that his designs for Eve are truly what make Megazone 23 as a whole iconic. This virtual idol is practically a showcase for new costume design and character models, where she will be sporting a puffy red and black leather jacket one minute, and then a knot covered white gown the next. 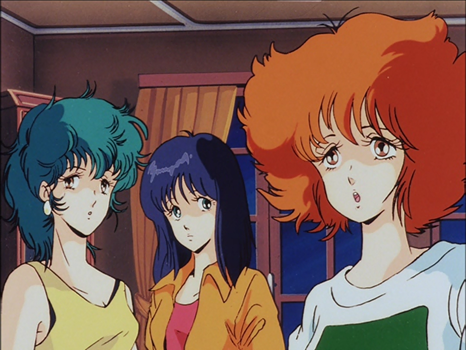 My only problem with Mikimoto’s character designs is that everyone’s eyes look like they are perpetually watery from roaming around a humid desert planet. Pros: For all of its bravado, Megazone 23 Part 1 is much understated when it comes to its sci-fi elements. It is all a little hard to explain, as you watch you are feeling that “this is all fine”, but then it will present you with a scene that makes you think “man was that cool, I really like this”. I guess you could say it grows on you. I should talk more about the mecha in Megazone 23, but writing restraints allow me only to compare them to the gun-blasting fights you see with Macross’s Valkyries. The voice acting stood out and fit perfectly. No need to restate how great the music is for the ears. Cons: Animation wise (and I truly hate to say this), looks rather dated. OVA budgets have always been a fluxing thing, but the fact that character’s faces were regularly off model took me out of it. The animation is stilted to a point that I can ignore it for a time, but it does draw on the nerves. Shogo’s devil-may-care/absent-minded attitude may draw the ire of many first time viewers. The release the three of us are working from is the latest ADV release that has all three parts in one complete collection. Megazone 23 Part 1 leaves you with this subtle feeling of enjoyment that is hard to convey in a limited scope like a review. It is an extreme avatar of what eighties anime was, but not in a way that makes it feel like a relic of the past. Now, a good amount of things that we review on CTBF are things that we already enjoy, so the only thing we have to do is reconsume and write. But Megazone 23 as a whole is completely new for us, and our young opinions are honestly interesting for interpretation. As fair as Part 1 is concerned, this is something I highly suggest you owe it to yourself to consume. 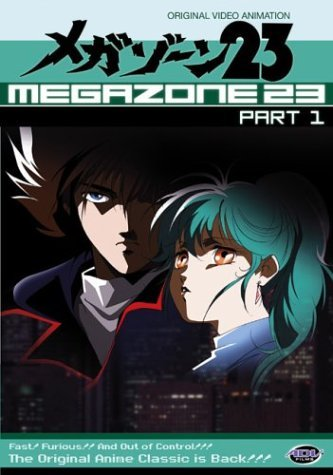 ‹ What Happens When CTBF Takes On The Megazone 23Complete Collection? Another great review of a personal favorite of mine. I covered this in the year 1985 (http://goldenani.blogspot.com/2013/04/1985-ova-boom-begins.html) for the golden ani-versary project . We even used similar screenshots =D . Great minds think alike. 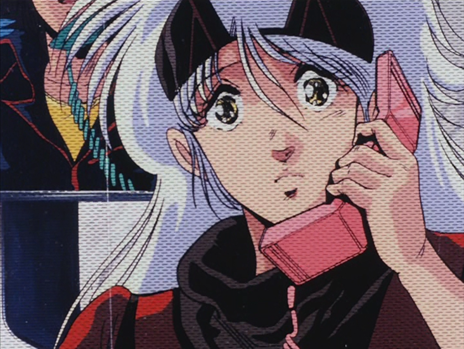 Anyway I also think this is the most 80’s anime ever. But that’s what makes it so good. I thought the animation was quite good, but there were small mistakes here and there and you can tell it was rushed but had a big budget. Matt Greenfield’s commentary is really worth a listen too btw. 80’s and 90’s OVAs were either these amazing singular pieces of art or promotion for a manga that never got released over in the West. Off the top of my head, Shinesman is the big 90’s OVA that exists to promote a manga that I feel can stand alone. Everything else is often to short to make an impact, unless it is a Apocalypse Zero sized one.